I picked up a fun little stamp set from Lawn Fawn called Clear to See You. 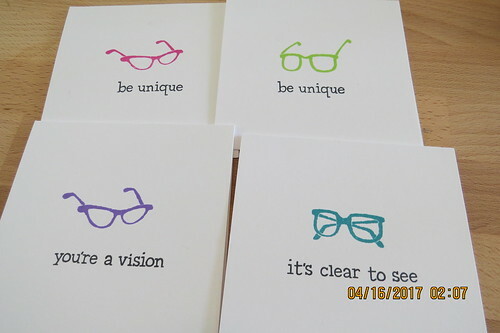 It is a set of eyeglasses and a couple of cute sentiments. I made a quick set of notecards with the set. I used Distress ink Wilted Violet, Peacock Feather, Twisted Citron, and Picked Raspberries for the glasses.